If you've ever felt like your shoulder "popped out of place," it's possible that you have loose shoulder ligaments. Some people describe this as being double-jointed. Maybe you can reach all the way over your head and touch your lower back with your hands clasped together. Although this is a fun party trick, loose ligaments can increase your risk of other shoulder injuries. Unfortunately, loose ligaments cannot be strengthened. Once they are stretched out, they stay that way. However, strengthening the muscles around the shoulder joint will help compensate for loose ligaments and reduce risk of further injury. 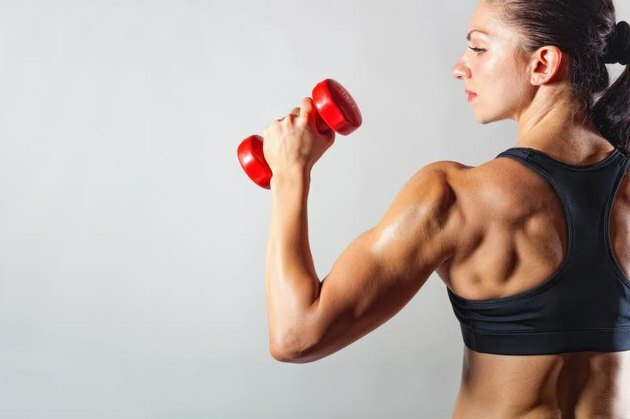 Ligament therapy exercises target the rotator cuff -- a group of muscles that help keep the ball in the socket of the shoulder joint, and muscles around your shoulder blades. Perform these exercises at home, or in a fitness center, with an elastic exercise band. Rowing exercises strengthen the muscles between your shoulder blades. Secure the middle of an elastic exercise band to a doorknob or in a door hinge at waist height. Face the door and hold one end of the band in each hand. With your arms at your sides, bend your elbows to 90 degrees. From this position, pull straight back on the band, squeezing your shoulder blades together as you move. Hold this position for 3 seconds, then slowly return to the starting position. Repeat 10 times, working up to three consecutive sets. External rotation is rotation of your upper arm away from your body. Perform the following exercise one arm at a time. Secure one end of the elastic band to a doorknob or in a door hinge at waist height. Hold the opposite end of the band in your hand. Stand sideways with the exercising arm away from the door. Keeping your arm by your side, bend your elbow to 90 degrees. Slowly rotate your forearm away from your body as far as possible. Don't let your upper arm move away from your side. Hold this position for 3 seconds. Slowly return back to the starting position and repeat 10 times. Work up to three sets. Internal rotation is rotation of your arm in toward your body. Also perform this exercise with one arm at a time. Secure one end of the elastic band to a doorknob or in a door hinge around waist height. Stand sideways with the exercising arm toward the door. Hold the opposite end of the band in this hand. With your arm by your side, bend your elbow to 90 degrees. Slowly pull your forearm in toward your body until it touches your belly. Hold this position for 3 seconds, then slowly return to the starting position. Repeat 10 times, working up to three sets. Bent-over rows target the muscles around your shoulder blades. Stand on the middle of the exercise band with your feet hip-width apart. 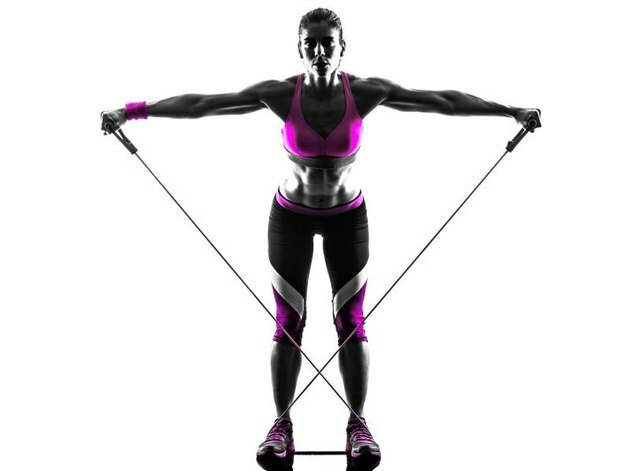 Criss cross the band at your lower legs then grab one end of the band in each hand. Hold your arms straight out to the sides at shoulder height. Hinge forward slightly at your hips to angle your chest toward the ground. Do not bend your lower back. Keeping your elbows straight and shoulders out to your sides, squeeze your shoulder blades together as much as possible. Hold the position for 3 seconds, then slowly return to the starting position. Repeat 10 times and work up to 3 sets in a row.